1. Supplies: The obvious solution for periods when travelling is to ensure you take lots of supplies with you, especially if you will be gone for several months. It might be difficult to buy your top choice of sanitary option when you are somewhere completely new, so think ahead and pack all the supplies you need to take with you. In addition to the sanitary items, also make sure that you take appropriate bags to dispose of them in. Flushing these kind of items is a hazard and prohibited in the majority of countries around the world. Make sure that you shower often when you are travelling, particularly when you have your period. Travelling can actually mess up your cycle in some way, including making your period heavier than usual. If you are in a particularly warm country like Thailand, it's really important that you stay as fresh as possible. 2. Comfort: Don't forget to pack comfortable clothes when you are travelling but you know your period is due. The last thing you want to be wearing is tiny dresses, skin-tight jeans or anything else that is not flattering or comfortable to that bloating we all get during our period. Make sure that you have some baggy t-shirts, track bottoms, leggings and anything else that is going to make you feel as comfortable as possible. Also make sure that you have plenty of underwear with you to help avoid any embarrassing situation. There is even disposable period underwear available nowadays so this is also worth considering. 3. STOP: Another option during your trip is that you stop your periods completely. If you are swimming a lot, wearing bikinis or have limited access to facilities - this might be the best choice for you. The only way to stop your period for a significant amount of time is with period delay medication. You should easily be able to get these from your doctor if you explain the situation. 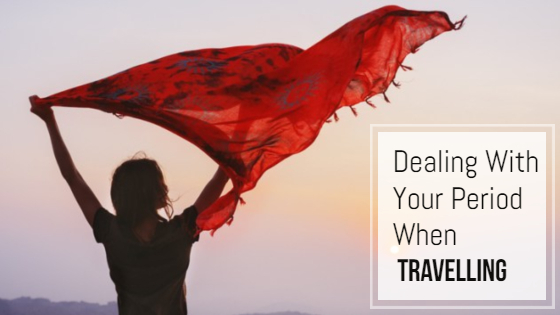 Many women prefer to do this while they travel because it means they are not limited in any way in terms of what activities etc. they can do. Period delay medication works in a similar way to the contraceptive pill. For the days that you are taking the medication, you will not get your period. These are completely safe to take although it is advised that you do not do it too often or you could mess up your cycles. If you do decide to use this method, make sure that you take enough of the pills to last you for the entire duration of your trip. As you can see, there are several ways that you can deal with your period when you are travelling. Whether you simply decide to take plenty of supplies with you or stop your periods all together is entirely up to you depending on your preferences. Take comfort in the fact that all women have to deal with this when they travel and it's still possible to have an amazing time. Making the necessary preparations will mean that this doesn't have to be a huge hassle so you can simply enjoy your trip, wherever that might be.